Al Koran only published a few books, but this one is our favourite. 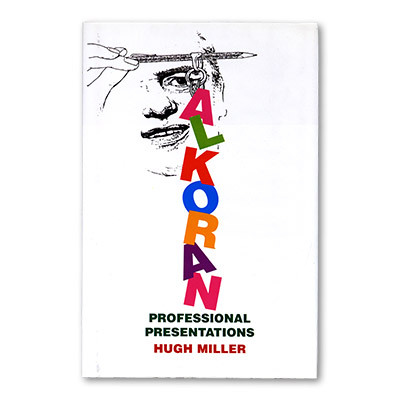 It was penned by Hugh Miller in 1967 and contains what we think is Al Koran's best work. The Gold Medallion: one of Koran's most famous pieces. The Koran Medallion is a mentalism classic! Princess Card Trick: not the Princess Card Trick that you might be thinking of. Here the performer manages to find 10 selected cards. Ring On Stick: a borrowed ring penetrates a wooden stick, even while two participants hold onto each end. Birthday Card Trick – the performer guesses birthdates of audience members. What a great, clear effect. Note Under Cup - our favorite Koran effect. You allow someone to secretly place a crumpled up bill under any of three upturned cups and you manage to identify which cup the bill is under every single time. The original publication was marred by poor photographic reproduction so this new edition from Martin Breese has illustrations by Paul Griffin based on the original photographs. Also, exclusively in this edition, Hugh Miller has contributed a fascinating and lengthy introduction which explains a great deal about the background of this book.